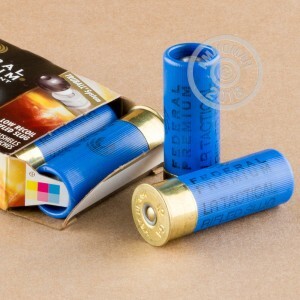 These 12 gauge shotshells from Federal's Tactical brand deliver strong terminal performance and maintain their effectiveness at ranges beyond those of buckshot ammo. 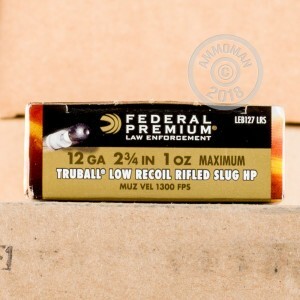 This ammo features Federal's accuracy enhancing Truball, which centers the slug in the shotgun's barrel and promotes consistent, accurate trajectories. Each shell in this box of 5 fires a one ounce (437.5 grain) slug at a muzzle velocity of 1,300 feet per second. Compared to hunting slug loads, this ammo produces a lower velocity but also significantly lower felt recoil. This is a worthwhile tradeoff for defensive use, as it reduces the risk of overpenetration and helps the defender achieve a faster rate of aimed fire. At the same time, the power level of this ammo is more than enough to stop an assailant who isn't of bear or elk size! Federal ammunition is made in the USA using quality components. Remember to fill your cart at AmmoMan.com with more than $99 worth of items to qualify for free shipping!